Facebook continues to crack down on non-consensual ad targeting with the release of their Custom Audience transparency feature later this month. The feature will allow users to pinpoint how an advertiser gained access to their contact information as well as if that data has been shared with other brands or partners. If you are using Facebook to advertise your business or running campaigns on behalf of your clients, read on to gauge the impact this could have on your efforts. Over the past few years, the public’s demand for privacy, security, and the safety of their private data has driven Facebook to develop stricter advertising policies. While Facebook has implemented quite a number of changes since the 2016 election and the 2018 Cambridge Analytica scandal, they have struggled with really being able to fully enforce these policies. In June 2018, the company unveiled a tool that required advertisers to pledge that they had permission to upload someone’s phone number or email address for ad targeting. However, the tool had no verification process and for the past eight months, Facebook has just taken businesses at their word, despite their financial incentive to lie. 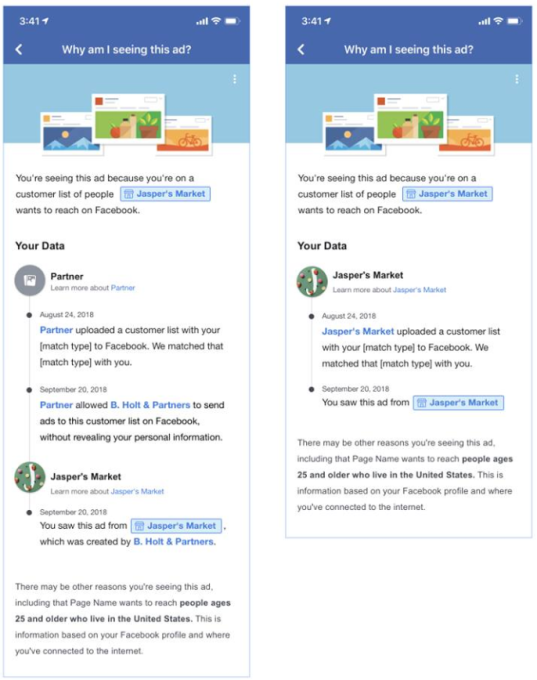 In November of 2018, Facebook launched a way for ad agencies and MarTech developers to specify who they were buying promotions “on behalf of,” however, until now, that information has not been used or made publically available in any way. Starting February 28th, Facebook is making what I feel to be one of its most impactful changes regarding user privacy to-date. 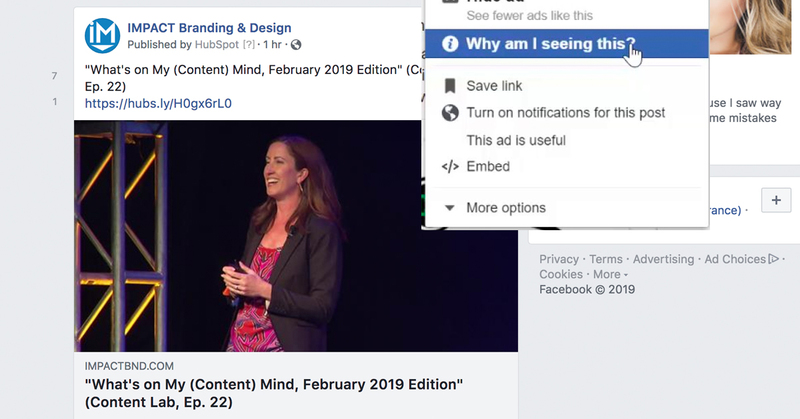 Deemed the Custom Audience transparency feature, all posts in the news feed will now have a “Why and I seeing this?” button added to the drop-down menu. By clicking on this button, users will not only be able to see when their contact information was uploaded and by whom, but also if their data has been shared between brands and partners. The increased level of transparency will give users interested in knowing more the ability to pinpoint what caused a brand to get a hold of their contact information. We have all joked around about how creepy it is to be targeted by a brand that you were literally only thinking about, right? With the new “Why am I seeing this” feature, users can dig a little deeper and get real answers. They’ll be able to better understand how the advertising on the platform works, and this kind of open education is a great way to build trust. While I feel like this is a major update that has the potential to affect how we as marketers reach our target audience, I am not sure how quickly we will feel the impact. The new level of transparency could increase users privacy settings, decreasing the amount of information we know about them and affecting how we build custom audiences. It could also potentially hurt your look-a-like audiences if your seed audiences aren't created with proper authorization. The feature will be available for users on February 28th, however, Facebook has no plans to announce it publicly. News of the Custom Audience transparency feature only came from a simple post shared by Facebook in the Facebook Advertisers Hub. That being said, if users do catch on and start experimenting with the new feature, we could face more limitations when it comes to user data. hat could, in turn, decrease the power that custom audiences provide businesses and advertisers. It is a little to soon to determine the long term effects but is it definitely something to keep an eye on. The people who break the rules and do dishonest things make it more difficult for those of us who are honest. Right now I think the best thing you can be doing as an advertiser or business using Facebook ads is to keep it legit. Ensure that you are only uploading lists to Facebook that you have permission to contact and do your due diligence to be an honest advertiser. If you are not already a member, hop over to IMPACT Elite and join the conversation. We will be sharing more in the coming weeks about the impact of the Custom Audience transparency feature.